Senior HR generalist Sarah Macke takes questions from eager Cincinnati-area students. One of VEGA Americas’ core values is responsiveness. It is hard-wired into the organization to quickly and thoroughly respond to the needs of customers, representatives, and colleagues. VEGA Americas also responds to the needs of the community by adopting an elementary school class through Cincinnati's Adopt A Class (AAC). 2018 marks VEGA Americas’ second year participating in the program, which has become an important part of the company’s community outreach according to senior HR generalist Sarah Macke who serves as the Adopt A Class team leader at VEGA. “It’s important for us to engage with the youth of our community. They will be the future leaders VEGA and other manufacturers will need in the coming years. We want to show children the many opportunities available to them in a manufacturing environment. Plus, AAC helps VEGA connect to other Cincinnati organizations who share the same passion for community involvement,” Macke said. After a brief presentation from VEGA Americas’ COO John Kronenberger, the students were divided into three groups to tour the three-building campus in Cincinnati, Ohio. Along the way, the groups made several stops to learn more about VEGA. One of the stops was at a 3D printer for a presentation from chief engineer Shawn Ahlers, an employee of over ten years. Ahlers gets to explain how 3D printing works, but he doesn’t participate for the technical conversation. In addition to a tour, students are treated to creative demonstrations from VEGA employees. Field service technician Sean Collins showed off switching technology. Lead engineer Jim Hook and engineering co-op Ryan Kroger used an ultrasonic sensor to measure the distance from a conference room ceiling to the crown of students’ heads. Instructional design associate Ashley Seibert wowed kids with an interactive animation of the VEGA Americas Learning Center Lab. At the end of the day, students left with a 3D-printed Eagle (the school’s mascot) but Macke hopes they walked away with much more. “I hope they realize that there are a variety of college degrees and career paths that can lead them to a great career in manufacturing. And, if they really enjoy math and science, then working at VEGA can be particularly interesting for both boys and girls. I also want them to know that there are people in their community who are here to support and encourage them throughout their school years,” Macke said. 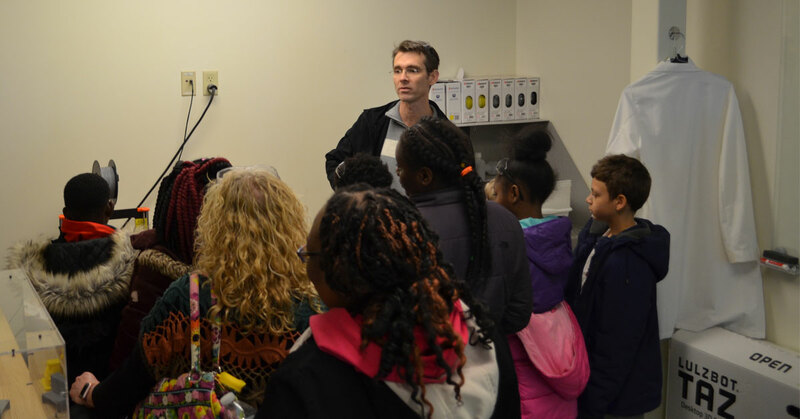 Featured photo: Chief Engineer Shawn Ahlers gathers students and chaperones for a demonstration of the 3D printer.